, a French writer of very great abilities, was the second son of a master-cutler at Paris and born there Jan. 30, 1661. He was intended, as well as his elder brother, for his father’s profession; when a Benedictine, perceiving in him a peculiar turn for letters, communicated this to his mother, and pressed her to give him a liberal education. The proposal was flattering, but as she had been left a widow, and had nothing to depend upon but the continuation of her late husband’s business, and was incapable of providing for his education, she was reluctant to lose the advantages of her son’s skill. The good | Benedictine, however, removed part of her fears, by procuring the youth a pension in the college of Du Plessis, and Roliin was now suffered to pursue the natural bent of his inclination. He distinguished himself immediately by parts and application, and easily obtained the first rank among his felloe-students. Many stories are told to his advantage in this respect, and how he became known and esteemed by the minister Pelletier, whose two eldest sons were of Rollin’s class. 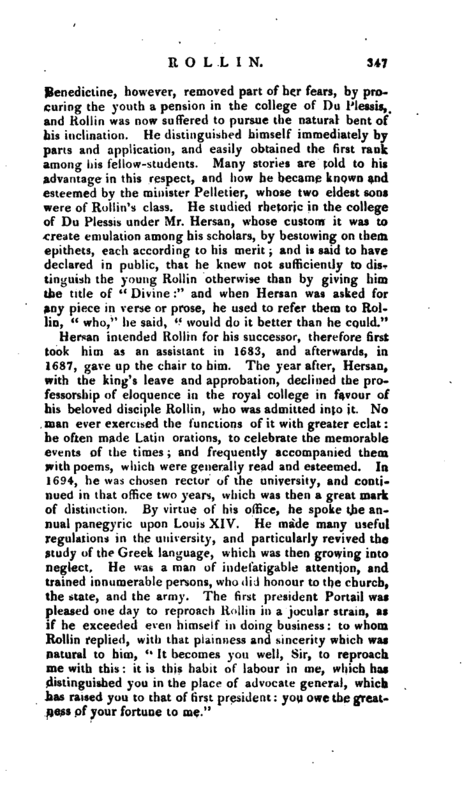 He studied rhetoric in the college of Du Plessis under Mr. Hersan, whose custom it was to create emulation among his scholars, by bestowing on them epithets, each according to his merit; and is said to have declared in public, that he knew not sufficiently to distinguish the young Roliin otherwise than by giving hirn. the title of “Divine:” and when Hersan was asked for any piece in verse or prose, he used to refer them to Roliin, “who,‘’ he said,” would do it better than he could.“Hersan intended Roliin for his successor, therefore first took him as an assistant in 1683, and afterwards, in. 1687, gave up the chair to him. The year after, Hersan, with the king’s leave and approbation, declined the professorship of eloquence in the royal college in favour of his beloved disciple Roliin, who was admitted into it. No man ever exercised the functions of it with greater eclat: he often made Latin orations, to celebrate the memorable events of the times; and frequently accompanied them with poems, which wer^ generally read and esteemed. In 1694, he was chosen rector of the university, and continued in that office two years, which was then a great mark of distinction. By virtue of his office, he spoke the annual panegyric upon Louis XIV. He made many useful regulations in the university, and particularly revived the study of the Greek language, which was then growing into neglect. He was a man of indefatigable attention, and trained innumerable persons, who did honour to the church, the state, and the army. The first president Portail was pleased one day to reproach Roilin in a jocular strain, as if he exceeded even himself in doing business: to whom Roilin replied, with that plainness and sincerity which was natural to him,” It becomes you well, Sir, to reproach me with this: it is this habit of labour in me, which has distinguished you in the place of advocate general, which has raised you to that of first president: you owe the greatness of your fortune to me," | Upon the expiration of the rectorship, cardinal Noailles engaged him to superintend the studies of his nephews, who were in the college of Laon; and in this office he was agreeably employed, when, in 1699, he was with great reluctance made coadjutor to the principal of the college of Beauvais. This college was then a kind of a desert, inhabited by very few students, and without any manner of discipline: but Rollings great reputation and industry soon made it a most flourishing society. In this situation he remained till 1712; when, the contests between the Jesuits and the Jansenists drawing towards a crisis, he fell a sacrifice to the prevalence of the former. F. Le Tellier, the king’s confessor, and bigoted agent of the Jesuits, infused into his master prejudices against Rollin, whose connections with cardinal de Noailles would alone have sufficed to have made him a Jansenist; and on this account he lost his share in the principality of Beauvais. No man, however, could have lost less in this than Rollin, who had every thing left him that was necessary to make him happy; retirement, books, and a decent competence. He now began to employ himself upon Quintilian; an author he justly valued, and not without uneasiness saw neglected. He retrenched in him whatever he thought rather curious than useful for the instruction of youth: he placed summaries or contents at the head of each chapter; and he accompanied the text with short select notes. His edition appeared in 1715, in 2 vols. 12mo, with an elegant preface, setting forth his method and views. 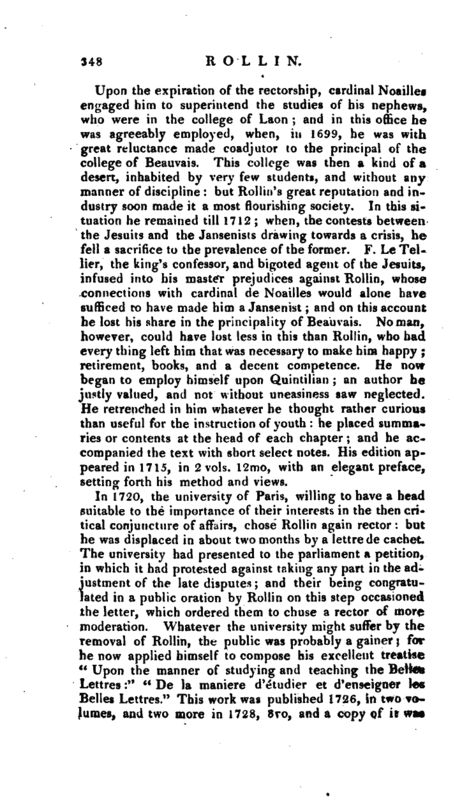 In 1720, the university of Paris, willing to have a head suitable to the importance of their interests in the then critical conjuncture of affairs, chose Rollin again rector: but he was displaced in about two months by a lettrede cachet. The university had presented to the parliament a petition, in which it had protested against taking any part in the adjustment of the late disputes; and their being congratulated in a public oration by Rollin on this step occasioned the letter, which ordered them to chuse a rector of more moderation. 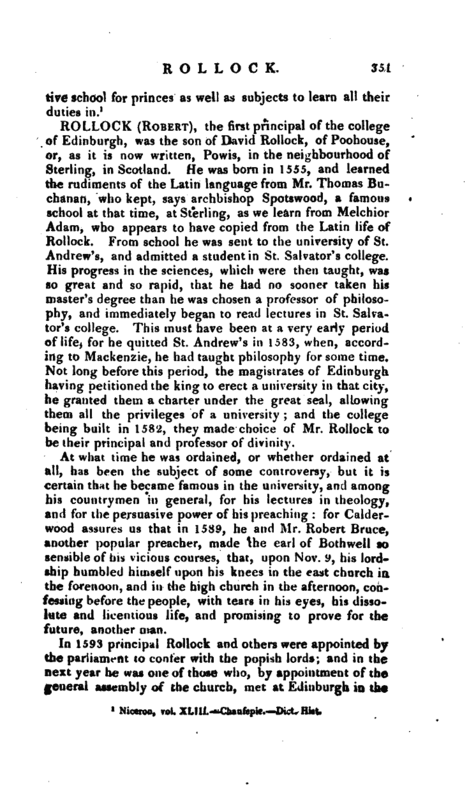 Whatever the university might suffer by the removal of Rollin, the public was probably a gainer; for he now applied himself to compose his excellent treatise <4 Upon the manner of studying and teaching the Belles Lettres:“” De la maniere d‘etudier et d’enseigner les Belles Lettres." This work was published 1726, in two volumes, and two more in 1728, 8vo, and a copy of it | presented to bishop Atterbury, then in banishment, who wrote to Rollin a Latin letter, of great beauty and elegance, which gives a just idea of our author and his writings. Whatever defects more recent inquiries have discovered in this work, it was for many years the first of its kind, and may yet be recommended as laying the foundation of a good taste. Encouraged by the great success of this work, and the happy reception it met with, he undertook another of equal use and entertainment; his “Histoire Ancienne,” &c. or “Ancient History of the Egyptians, Carthaginians, Babylonians, Medes and Persians, Macedonians and Greeks,” which he finished in 13 vols. 8vo, and published between 1730 and 1738. 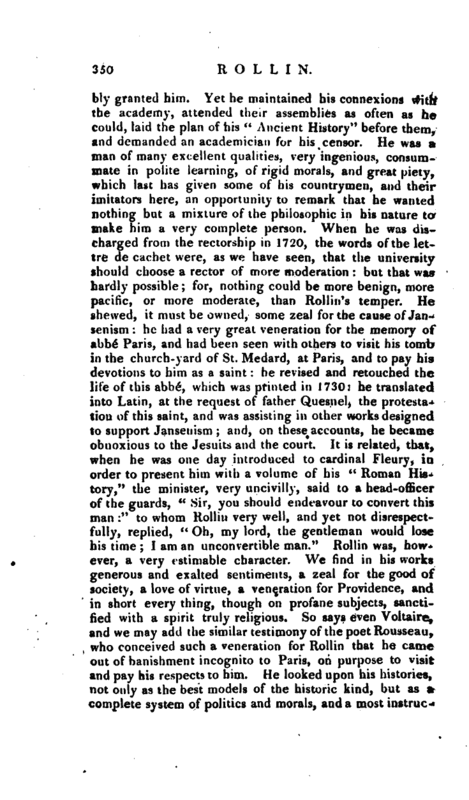 Voltaire, after having observed that Rollin was “the first member of the university of Paris who wrote French with dignity and correctness,” says of this work, that “though the last volumes, which were written in too great a hurry, are not equal to the first, it is nevertheless the best compilation that has yet appeared in any language; because it is seldom that compilers are eloquent, and Rollin was remarkably so.” While the last volumes of his “Ancient History” were printing, he published the first of his “Roman History;” which he lived to carry on, through the eighth and into part of the ninth, to the war against the Cimbri, about seventy years before the battle of Actium. 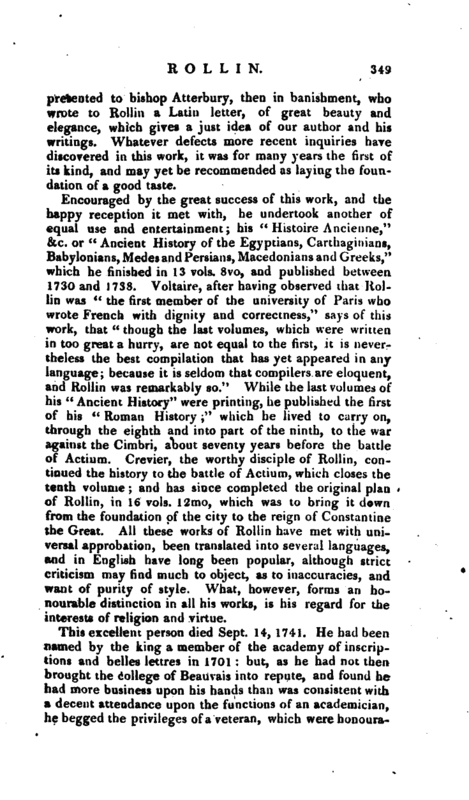 Crevier, the worthy disciple of Rollin, continued the history to the battle of Actium, which closes the tenth volume; and has since completed the original plan of Rollin, in 16 vols. 12mo, which was to bring it down from the foundation of the city to the reign of Constantine the Great. 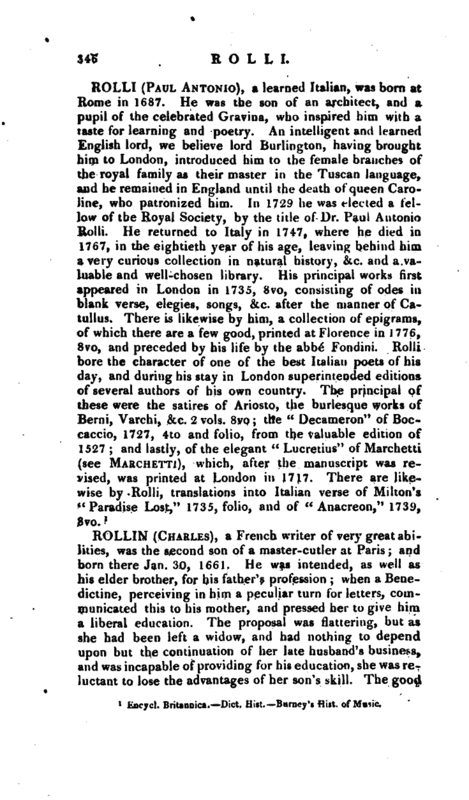 All these works of Rollin have met with universal approbation, been translated into several languages, and in English have long been popular, although strict criticism may find much to object, as to inaccuracies, and want of purity of style. What, however, forms an honourable distinction in all his works, is his regard for the interests of religion and virtue. Niceron, vol. XLIII. -—Chaufepie.—Dict. Hist.